A door supervisor licence is essential if you want to work in a security role at a licensed venue, this includes supermarkets and events that sell alcohol. What are licensable activities? Manned guarding in or at licensed premises, would be deemed a licensable activity specifically in relation to Door Supervisors unless the role purely involves the use of CCTV equipment. Security Operatives working as a cash and valuables in transit, security guard or close protection officer have different licensable roles. A Door Supervisor licence is mandatory if you are performing this activity as a contractor or if you are working for a security company or sub contracting. What is a licensed premises? Any venue or premises that sells alcohol by retail. Membership clubs who supply alcohol to members. Venues involved in the provision of regulated entertainment or late night refreshment. How much do door supervisors earn? On average door supervisors earn around £10 to £15 an hour. What is the main role of door supervisors? To make sure customers have an enjoyable experience in a safe environment. You'll check customers aren't underage or carrying illegal substances or objects, like drugs or weapons. The first thing you do is enrol on a door supervision course that is recognised by the Security Industry Authority (SIA). There are 4 training modules and 3 exams. Your training will take place over a minimum of at 4 days, but no longer than 5 depending on the size and competency of the class. The modules you must study are: ◦ SIA’s ‘Common’ module ◦ Door supervision module ◦ Conflict management module ◦ Physical intervention skills module If you have completed the common unit before as part of a different license linked qualification you will not have to repeat that module again. For example if you have a door supervisor qualification and you want to enrol on a CCTV course you are not required to resit the common unit again. Skills for the job Candidates that are best suited to the role of a door supervisor: • quick thinker decision maker • good customer service skills • good observation skills • strong communication skills • the ability to defuse potentially violent situations What are the working hours? The working ours are usually evenings and weekends shift patterns depend on the venues opening times. Don't forget door supervisors are also qualified to perform the role of a security guard. Career progression Team leader or regional Manager or you may decide to set up your own security business. 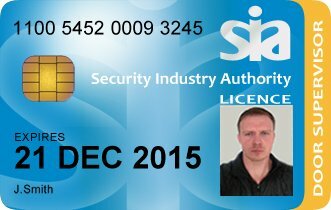 SIA licences & grandfather rights A close protection licence gives you the right to work as a door supervisor. A door supervisor licence gives you the right to work as a security guard. Here at In2 security training our mission is to provide the best value security courses in the security industry. Because we have SIA training centres all over the country were well equipped to find the closest SIA course to suite you.